On Wednesday, March 6, the MDivX guiding team shared some significant updates at the faculty/staff shared learning time. The PowerPoint presentation they created has been made available for all to see the latest developments in this significant project! Thanks to everyone who participated in the information session about what we’re hearing from the church! For those who were unable to attend live, here’s the video and PowerPoint presentation from the conversation. Our vision to lead faithful innovation for the sake of the gospel of Jesus Christ calls us to listen deeply to our church partners. Together, we must discern what the Spirit is innovating at the grass roots, where current practices are breaking down, and what challenges and opportunities Christian communities and their leaders face. This fall, teams of faculty/staff traveled to a dozen ELCA synods across the country to listen to local pastors, lay leaders, and synodical staff. We saw firsthand signs of new life and struggle in local ministry contexts. In response, we put together a report that summarizes what we heard in that listening, along with other research that has been conducted at Luther Seminary since 2015. This report will guide all the innovation work we do at Luther. And as our listening to the church deepens, we expect to add to it in the coming months and years. 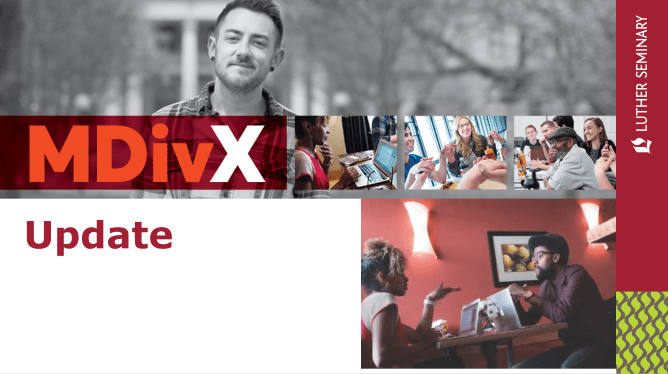 Our new MDivX video is now live on YouTube. It shares some of the hopes and dreams we have for the project–as well as some fantastic interviews with members of the Luther community! WHERE IS GOD CALLING NEXT? Our new vision calls us to lead faithful innovation for the sake of the gospel of Jesus Christ in a rapidly changing world. This microsite is here to keep you up to date on all the initiatives the Luther Seminary community is innovating together!